Scarcely a day goes by without more evidence to show why the Government's obsession with wind turbines, now at the centre of our national energy policy, is one of the greatest political blunders of our time. Under a target agreed with the EU, Britain is committed within ten years â€” at astronomic expense â€” to generating nearly a third of its electricity from renewable sources, mainly through building thousands more wind turbines. But the penny is finally dropping for almost everyone â€” except our politicians â€” that to rely on windmills to keep our lights on is a colossal and very dangerous act of self-deception. These windmills have set back civilization 500 years. The failure of Britainâ€™s wind farms to produce electricity in the extreme cold will cost billions of pounds, create an economic crisis and lead to blackouts, leading industrialists have warned. To cover up the ineffectiveness of wind farms the Government will be forced to build emergency back-up power plants, the cost of which will be paid by industry and consumers. Jeremy Nicholson, director of the Energy Intensive Users Group, which represents major companies employing hundreds of thousands of workers in the steel, glass, pottery, paper and chemical industries, said the failure of wind power had profound implications. He was speaking after new figures showed that during the latest cold snap wind turbines produced less than two per cent of the nationâ€™s electricity. And the cost of the standby generation will be paid for by industry and households through higher bills â€“ which could double by 2020. Industry regulator Ofgem has already calculated that the cost of achieving sustainable energy targets â€“ set by Brussels but backed by the British Government â€“ will amount to Â£200 billion, which will mean that annual household fuel bills will double to about Â£2,400 on average within the next ten years. In the last quarter ending December 23, wind turbines produced on average 8.6 per cent of our electricity, but the moment the latest bad weather arrived with snow and freezing temperatures, this figure fell to as low as 1.8 per cent. The slack was immediately taken up by efficient, but dirty, coal-fired power stations and oil-fired plants. In fact last year, the failure of wind power to produce electricity was even more profound. Then, over a few days, the lack of wind meant that only 0.2 per cent of a possible five per cent of the UKâ€™s energy was generated by wind turbines. So little energy was generated then that the National Grid, which is responsible for balancing supply and demand of energy in the UK, was forced to ask its biggest users â€“ industry â€“ to ration supplies. What really concerns industrial users is that it is Government policy to put wind power at the centre of its efforts to ensure that 30 per cent of electricity is generated by renewable resources by 2020. This means that the number of turbines now running â€“ 3,140 â€“ will have to be massively increased to well over 6,000 in ten years time. 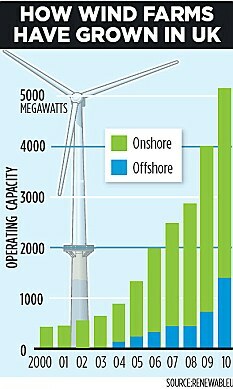 But this huge surge in wind farm activity will come at the same time as an EU Directive will insist that we close down our coal-fired and oil-fired power stations. Mr Nicholson said: â€˜We can cope at the moment because there is still not that much power generated from wind. But all this will change. What happens when we are dependent on wind turbines for 30 per cent of our power and there is suddenly a period when the wind does not blow and there is high demand? The Government is aware of the dangers of relying on intermittent power sources and is working on plans to encourage energy companies through financial inducements to have stand-by generation. Mr Nicholson said: â€˜At least the Government is aware of the problem, but it will cost billions to put these measures in place and we will have to pick up the tab. A Department of Energy and Climate Change spokesman said: â€˜Wind power provides a home-grown source of electricity that doesnâ€™t produce carbon dioxide. The National Grid is also aware of the problem and has set up a team to look at solving the problem of erratic energy supplies. One of the solutions being considered is changing demand at times of crisis. For example, setting up systems to stop electricity supplies to millions of fridges for an hour or so. This would be possible by having â€˜smartâ€™ meters and would save massive amounts of energy. Stuart Young Consulting, with support from the John Muir Trust, has released a report studying the ability of wind power to make a significant contribution to the UK's energy supply. It concludes that the average power output of wind turbines across Scotland is well below the rates often claimed by industry and government. Indeed, for numerous extended periods of time all the wind turbines in Scotland linked to the National Grid muster less than 20MW of energy - that's enough power for a mere 6,667 households to boil their kettles for a cup of tea. Stuart Young, author of the report, said, â€œOver the two-year period studied in this report, the metered windfarms in the U.K. consistently generated far less energy than wind proponents claim is typical. The intermittent nature of wind also gives rise to low wind coinciding with high energy demand. Sadly, wind power is not what it's cracked up to be and cannot contribute greatly to energy security in the UK." A wind farm has been paid Â£1.2 million not to produce electricity for eight-and-a-half hours. The amount is ten times greater than the wind farm's owners would have received had they actually generated any electricity. The disclosure exposes the bizarre workings of Britain's electricity supply, prompting calls last night for an official investigation into the payments system. The Â£1.2 million will go to a Norwegian company which owns 60 turbines in the Scottish Borders. 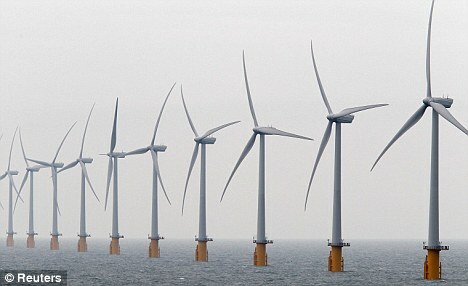 The National Grid asked the company, Fred Olsen Renewables, to shut down its Crystal Rig II wind farm last Saturday for a little over eight hours amid fears the electricity network would become overloaded. The problem was caused by high winds buffeting the country in the wake of Hurricane Katia. In total, 11 wind farms were closed down last week, receiving a total of Â£2.6 million. The money - detailed in calculations provided by National Grid - will be added on to household bills and paid for by consumers. As Britain pushes for more and more wind farms, critics claim the size of the 'constraint payments' will grow accordingly - raising serious concern about the long-term suitability of wind power to meet Britain's energy needs. How shall we produce our electricity? so... ... what's the solution? Produce? How about capture it. Free electricity for all! Despite billions in taxpayer subsidies pumped into the so-called â€œgreen-energyâ€� industry, almost 15,000 windmills â€” maybe more â€” have been left to rot across America. And while the turbines have been abandoned over a period of decades, the growing amount of â€œgreen junkâ€� littering the American landscape is back in the headlines again this week. Across the country, subsidized wind farms are meeting increasing resistance â€” and not just from taxpayers and electricity consumers forced to foot the bill. "If wind power made sense, why would it need a government subsidy in the first place?â€� wondered Heritage Foundation policy analyst Ben Lieberman, who deals with energy and environmental issues. â€œIt's a bubble which bursts as soon as the government subsidies end." It turns out that wind power is expensive and inefficient even in the best wind-farm locations in the world. And regular power plants always need to be on standby in case there is no wind, not enough wind, or even too much of it â€” a fairly regular occurrence. That is why, when the tax subsidies run out, the towering metallic structures are often simply abandoned. In their wake: a scarred landscape and dead wildlife â€” the very same ills offered as justifications by administration officials for preventing oil exploration. Even environmentalists are jumping on the anti-wind power bandwagon. In California, where state mandates and subsidies have led to a boom in subsidized â€œgreenâ€� energy projects, a San Francisco-based company just announced last week that it was halting plans to build a new wind farm. The scheme was shelved over concerns about the danger it would pose to birds. The press is starting to ask questions, too. â€œAs Beaufort County [North Carolina] considers the proposal of Pantego Wind Energy, LLC's to build 49 1.6MW wind turbines on 11,000 acres of land, it may be of interest to some that the trend in the industry is to abandon such projects once the tax credits expire,â€� noted the Beaufort Observer on November 19. The editorial urged county commissioners to attend a seminar exposing the â€œBig Windâ€� industry hosted by the John Locke Foundation next month. Around the world, concern about wind turbines is growing as well. In the UK, the Daily Express reported on November 28 that government ministers were being urged to abandon the race to build wind farms because they can cause â€œlife-threateningâ€� illnesses. Of course, dead birds, health problems, and massive wealth destruction are not the only reasons to stop subsidizing wind farms. Other environmental concerns exist, too. The symbol of Green renewable energy, our savior from the non existent problem of "Global Warming," abandoned wind farms are starting to litter the planet as globally governments cut the subsidies taxes that consumers pay for the privilege of having a very expensive power source that does not work every day for various reasons like itâ€™s too cold or the wind speed is too high. In recent days, a wave of articles and opinion pieces highlighting the wastefulness and destructiveness of wind farms swept the worldwide web. But with so much tax money at stake for the green-power industry, which lobbies intensely for ever more money, it will be hard to end the subsidies which generated the bogus â€œindustryâ€� in the first place. The Solyndra debacle, however, has created what analysts called a serious public-relations problem for subsidized â€œgreen-energyâ€� producers of all stripes. And then there is â€œClimategate2.0.â€� The scandal, surrounding a second batch of embarrassing e-mails from â€œclimate scientistsâ€� leaked last week, has dealt another serious blow to the foundation of it all â€” United Nations-backed global-warming alarmism. Analysts have said that if and when tax subsidies to wind power and other green-energy schemes are finally cut, the whole house of cards will come crashing down almost instantly. But then a new question arises: Who will clean up the mess? Germany could be struck by power blackouts this winter as the country struggles with a shift to renewable energy the economy minister has warned. Philipp Rosler said Germany is faced with a repeat of the power shortages experienced last year that threatened to plunge parts of the country into darkness. "Last winter we had a pretty tense situation, and this year we could see the same again, and perhaps even next year as well," he said in an interview with the newspaper Passauer Neue Presse. The move away from old forms of energy production has become one of Chancellor Angel Merkel's key policies, and the government wants four fifths of German energy produced by renewable sources by 2050. To achieve this it has begun to take old fossil fuel power stations offline, and has also committed itself to phasing out nuclear energy by 2022. Filling the void left by fossil fuels and nuclear power however has already placed a strain on existing capacity in the national grid. During a cold snap in February last year the pressure on electricity capacity in the Hamburg region pushed the grid to breaking point and forced some heavy industry plants to shut down. Despite significant investment in wind and solar power Germany still faces an energy shortfall, and is also hamstrung by a lack of north-south power lines shifting electricity generated in North Sea wind farms to the industrial centres in the south. Experts have warned that another hard winter coupled with little sunshine and wind, thus making wind and solar power redundant, could lead to blackouts. The shift to renewable energy is also taking a toll on family budgets. On Monday Germany's electrical grid operators announced that a special tax levied on consumers to finance subsidies for green energy would increase by almost 50 per cent. We are having the same funny business in the county I am at now with Solar Farms.